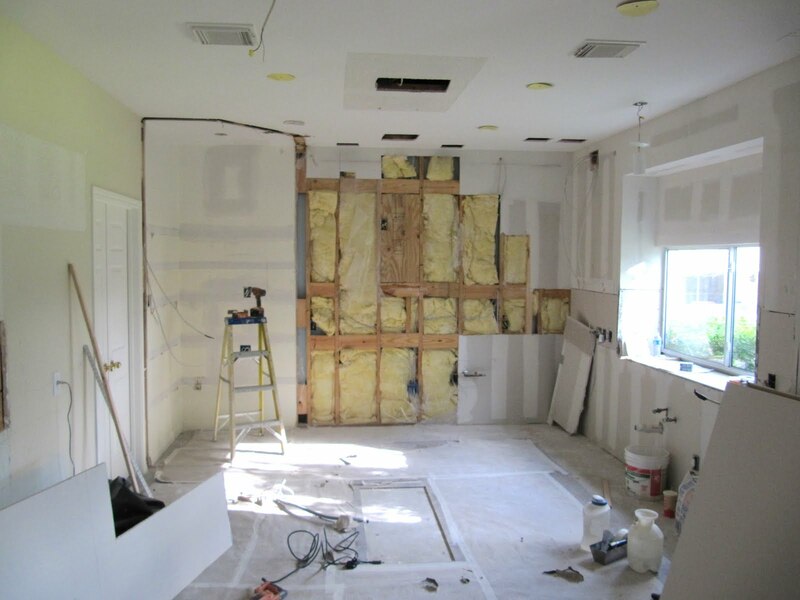 Here's the state of the kitchen yesterday morning, even more gone than Day 1. The sheetrock wound up with so many holes that it became easier to just tear it out. You can see that the ceiling looks like a pincushion. The plywood is support for the hood to come. This is the part where it's not so clear what's happening. Wiring and plumbing is getting relocated to needed positions, and there's a lot of new wiring as well -- undercabinet lighting, puck lights in the glass cabs, recessed cans, pendants, etc. Today, the sheetrock is all back up and getting taped and floated. The can lights are being cut out and extra wiring/boxes are being sealed up. Tomorrow is texture day; Monday is paint day. The cabinets should be installed on Tuesday!